Next time you wrap your fingers around a coffee mug, pick up a grocery bag, or scoop up some water to wash your face, thank your wonderful hands. Since we use our hands for nearly everything, we often take these anatomical blessings for granted. Unless, of course, you have arthritis or an injury– then your hands may be painful, swollen, and stiff, especially in the morning. They may ache and simple things like picking up a key, holding a jar, and chopping food may be difficult. While arthritis and other health concerns can be challenging, there are ways to reduce the stress to your hands and protect them. Follow these tips for helpful ways for taking good care of your hands. Simple daily hand exercises can help reduce pain and swelling while improving your muscle strength, flexibility, and range of motion in the joints. If you experience any pain, soak your hands in warm water while performing the exercises. You can’t avoid using your hands entirely; but, you can listen to your body and change the way you go about certain activities to diminish the strain on your hands. Re-think painful activities. If chopping onions and vegetables hurts your hands, use fresh and frozen pre-cut options. Is it hard to open a jar? Use easy-open containers. Use two hands to lift or grab an object. Pick up a gallon of milk with both hands rather than using one around the handle. 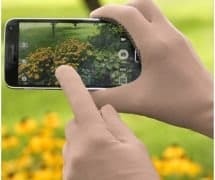 Use your whole hand rather than just your thumbs. Don’t lift heavy plates or bowls by grabbing them with your thumbs; carry them across both palms. Rest and stretch. Stop to take a break and stretch during tasks that stress your hands, like vacuuming or washing dishes. In the kitchen -a knife with a curved blade that rocks as you cut, reduces the stress on your hands. The Duo Glide Knife has earned the Arthritis Foundation Ease-of-Use commendation. When traveling- carry a light weight backpack style bag you can load up without straining your hands and arms while carrying your lunch and cameras. The Flip & Tumble Backpack folds into a tube and opens to a full size, lightweight pack. 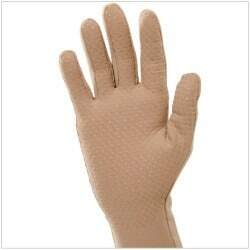 Out in the garden– good gloves that fit comfortably and help you grip and pull are a must. Easy-to-wear, lightweight gloves such as Protexgloves are a great gardening option. Wearing splints or braces that support your fingers/thumbs or gloves that help with swelling can allow for better movement and help relieve pain. It is always recommended that you consult with your healthcare provider on what will work best for you. 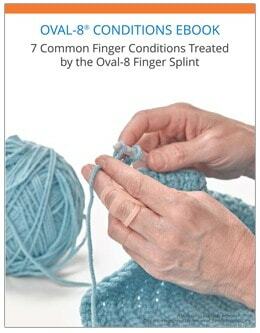 Finger splints can be worn to hold your fingers in a functional position. 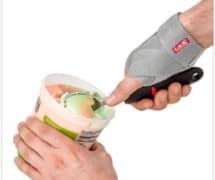 The Oval-8 Finger Splint is thin and light weight, and can be worn day or night without limiting hand movement. Thumb splints can help support your thumbs and limit motion to help relieve pain. Lightweight less resistive splints can be a good starting solution. 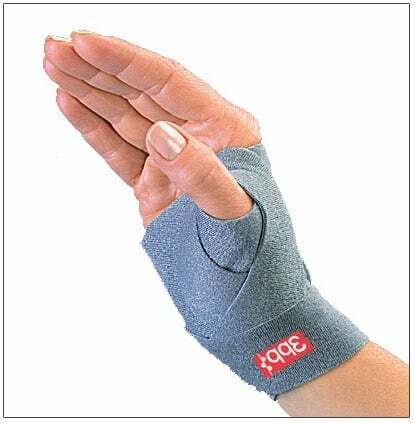 Often, all you need is a light support that provides compression around the joint(s) to support the thumb, while still allowing you to function. For light support, the 3pp ThumSling supports the CMC joint and applies light compression to help reduce slipping and grinding on the joint. Protective gloves not only provide protection, but can help keep your hands from swelling for better function and movement. Protexgloves with light compression are soft and comfortable and can help make every day activities easier. Your health care provider knows your health history and may recommend over-the-counter medications or joint relief products tailored to your needs. Nonsteroidal anti-inflammatory drugs (NSAIDs), like ibuprofen (Advil, Motrin) and naproxen (Aleve), are commonly used to help with inflammation. Analgesics, such as acetaminophen (Tylenol) and aspirin or topical pain creams(Topricin) can also help reduce pain. They may also recommend a visit with a physical or occupational therapist who specializes in treating conditions of the hand. Therapists can evaluate your needs and help you with exercises and techniques to relieve pain and make performing daily activities easier and more satisfying. Like what you’ve read? Click here to subscribe to the blog! 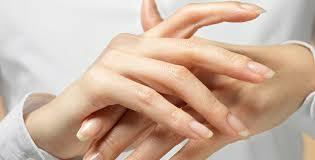 Looking for More Information On Products To Help Your Hands? Our blogs are educational in nature and are not intended as a substitute for medical advice. Because your condition is unique to you, it is recommended that you consult with your health care provider before attempting any medical or therapeutic treatments. We are always happy to answer questions about products mentioned in our blogs, however, we cannot provide a diagnosis or medical advice. My father is starting to get arthritis in his hands and it is really annoying for him. So, I like that you talked about how it would be good for him to do some exercises to help loosen up his joints. It does seem like a good idea for him to think about getting some treatments as well. What hand exercises do you recommend? You mention in point # 1 that hand exercises can help with strength and range of motion but you do not say what they are. Our blogs Simple Hand Exercises to Help Your Arthritis and What Will Help The Swelling In My Hands discuss exercises that can help increase your hand muscle strength, range of motion and flexibility to help lessen your pain and inflammation. You may also wish to visit this link on our website http://www.ohmyarthritis.com/contactus.aspx to find a hand specialist near you who can recommend a treatment plan that may include exercises. I hope this helps! Don’t Wait To Feel Better! Easy-to-wear splints, braces & products to live life well!